I’m skimming over a thoroughly potholed logging road in the shadow of the Chief just outside Squamish, BC. Below me is the Konker KSM200, a diminutive supermoto and one of the first wave of the storm of Chinese motorcycles to reach our shores. You might not be familiar with Konker, but the Langley, BC importer has been in business for 5 five years and boasts some 72 dealers Canada wide. As a brand Konker has serious prejudiced fight. Over the past few years Chinese motorcycles have become synonymous with poorly constructed, shoddily welded disposable-bikes with components ready to drop into the nearest landfill. Yes, an entire countries motorcycle industry informed by the offerings found ready to collapse in the aisle of your nearest Canadian Tire. 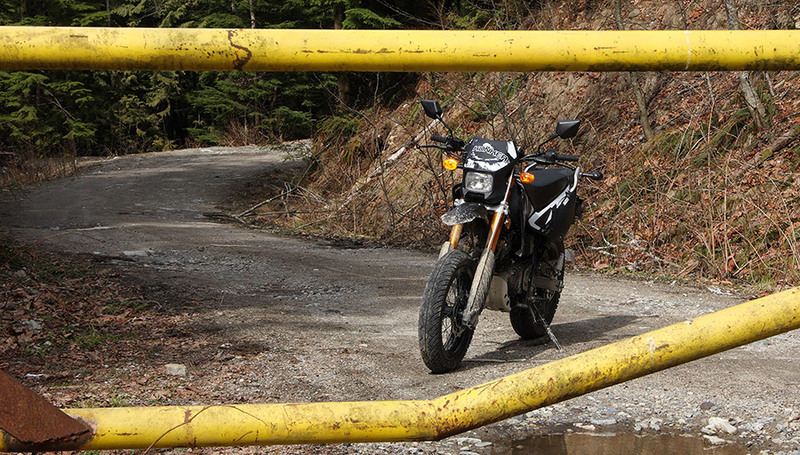 So it’s a relief as $7000 worth of used KTM 640 Adventure slides by to my left and roars off into the distance – yet not as quickly as I expect. 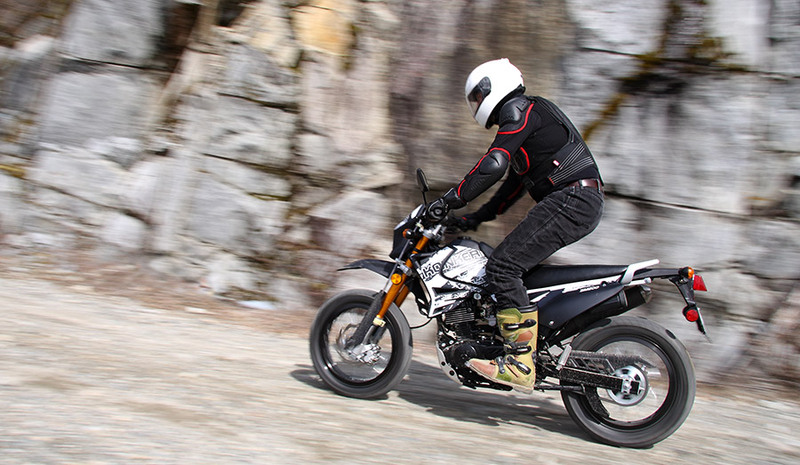 And a quick glance down confirms it, the $2.995.00 Konker’s speedo hovers comfortably just below 80kph – pretty much at the limits of my dirt riding ability given the limited grip of the little supermoto’s street tires. 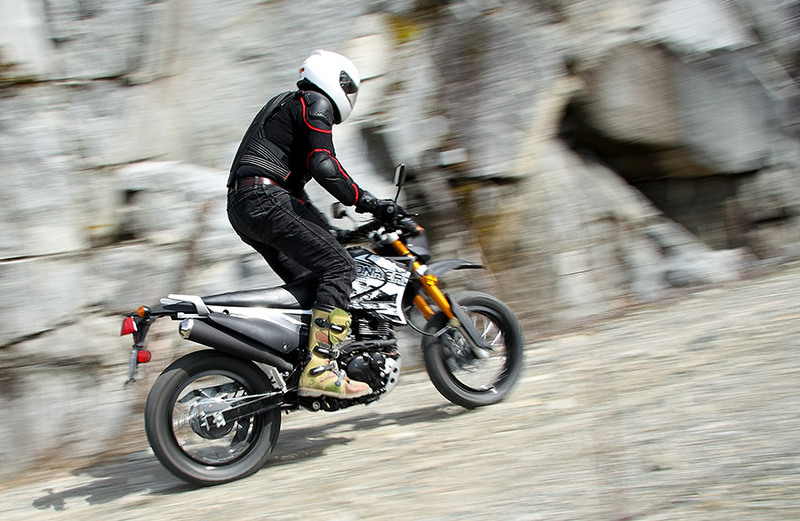 Calling the Konker a supermoto might be a bit of an overstatement. With a 199.3cc engine pushing out 16 hp (claimed) and approximately 14 ft-lbs of torque (by feel) there’s not much power to be had, making the Konker more “moto” than “super”. The engine is the same air-cooled single-cylinder four-stroke unit that powers the Suzuki DR200. Konker comes to it by way of a Suzuki partnered factory that handles Chinese domestic production. That partnership also explains the Japanese refined feel of the transmission. Shifts are clean, smooth and easy. That the Konker is in essence a Suzuki, takes care of major concerns around reliability and parts availability given the profundity of Suzuki shops around. As important, Konker is backing its product with a one year warrantee with full coverage for parts and labour. New riders will find the fueling though the Japanese 26mm Mikuni carb (versus the DR200SE’s 31mm one) to be linear and utterly predictable, making for a friendly ride experience. The engine is near instant to start quick to warm up, and should the occasion require it has a kick start. Out on the freeways whipping the Konker KSM200 mercilessly vibrates the bike up to an indicated 125kph under 215lbs of rider… after considerable run up. That top speed will have most enthusiasts rolling their eyes, but you don’t buy a 200 for freeway work. For a new rider the Konker will offer a solid introduction to motorcycling, allowing for traverses between back roads and dirt riding without need for a trailer. Better, the KSM200 is stable and confident at highway speeds and the chassis feels like it could handle the power of an engine twice the current plants size. At this point one statistic shines through; 2.94 L/100km (or for those of us who are old school 80mpg). Our riding was not gentle, it was not kind, and the Konker consistently offered this gas millage and better, sipping gently from the 10.6L tank without the indignity of riding a scooter. Suddenly $4.00 of gas offers an entire day of backroads and trails entertainment rather than 15-minutes of short-lived Starbuck bliss. Ahead the other riders are in conference, I touch the rear break lever bringing the KSM200 to a halt. Out back the finest in 1970’s braking technology, the drum brake, won’t speak to enthusiasts. 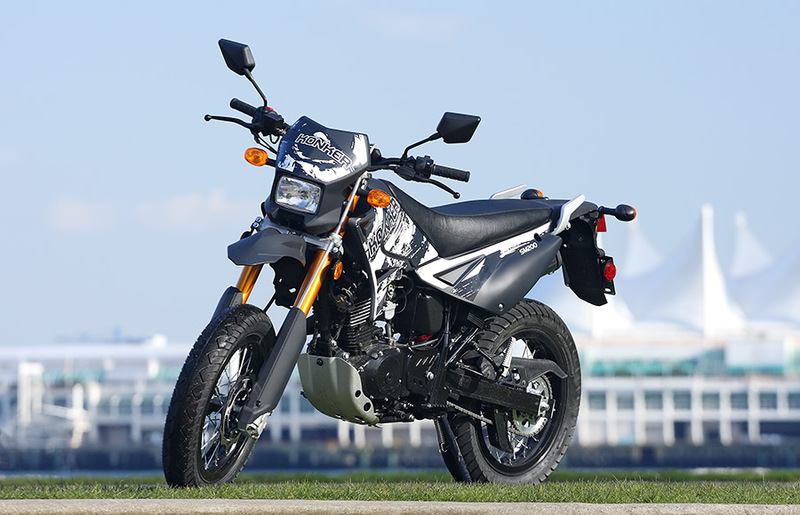 It’s not big on feel, but offers plenty of stopping power for a bike this size, and half the fun of a bike like the KSM200 is locking the rear wheel and sliding around anyways. The front brake however makes up for the rear, with steel braided line, relatively good feel at the lever, and good purchase when the two-pistoned caliper puts the squeeze on the single 290mm “wave” rotor. 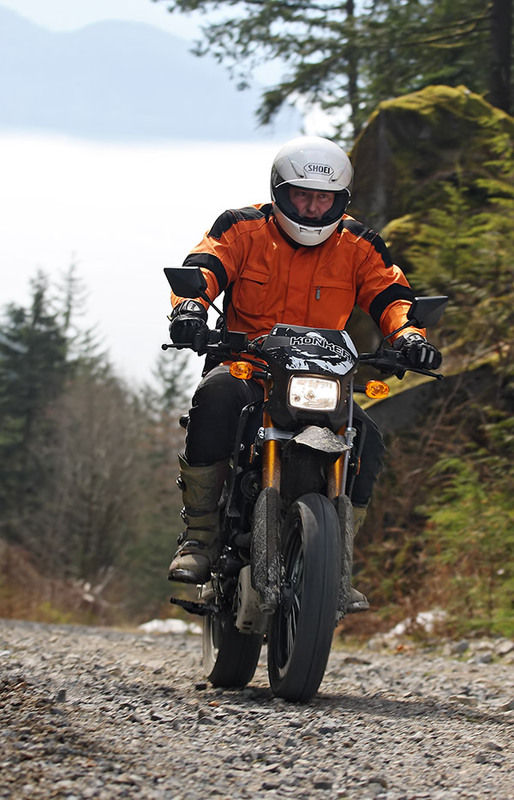 I’d like to say the Kingstone tires, precambrian-soft and similar to the set Fred Flintstone had on his first motorcycle, bite in confidently, but they are the one of the few whiffs of corner cutting on the Konker. Off road the rubber doesn’t offer much grip, but fruit-fly light at 112.49kg/248lbs (claimed) the Konker doesn’t require loads of traction, and is perfectly happy cavorting down trails on rubber that would see bigger bikes stumble. On road the tires are fine until the rains hit, then they betray a sketchy lack of grip leaving even confident riders shaking their heads. Making up for the low-grip rubber is well sorted suspension (complete with upside down forks) that soaks up bumps and potholes and maintains good connection with dirt or asphalt. 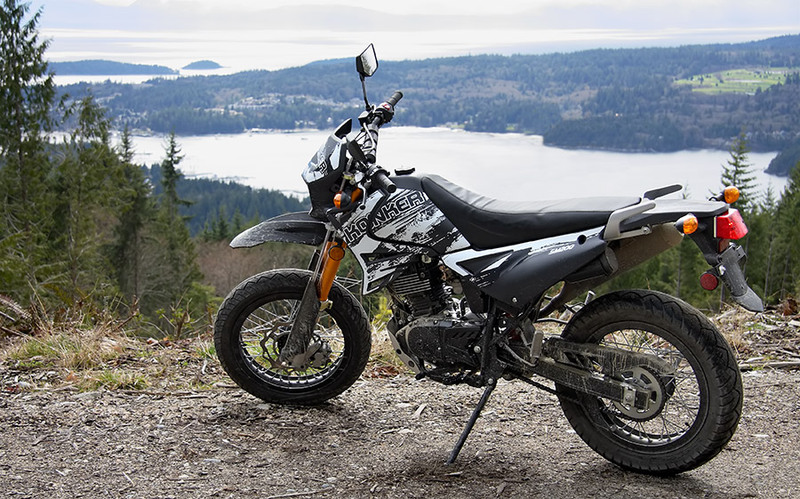 Comparison to other bikes around this price point, the suspension alone makes the KSM200 a standout. Overall the Konker’s mindset is one of well thought out economy. Yes, there are a few tatty stickers waiting to peel away and inexplicable the kill-switch’s off position is inverse to every other bike I’ve ridden, but the switchgear looks like it escaped from a Honda parts bin. 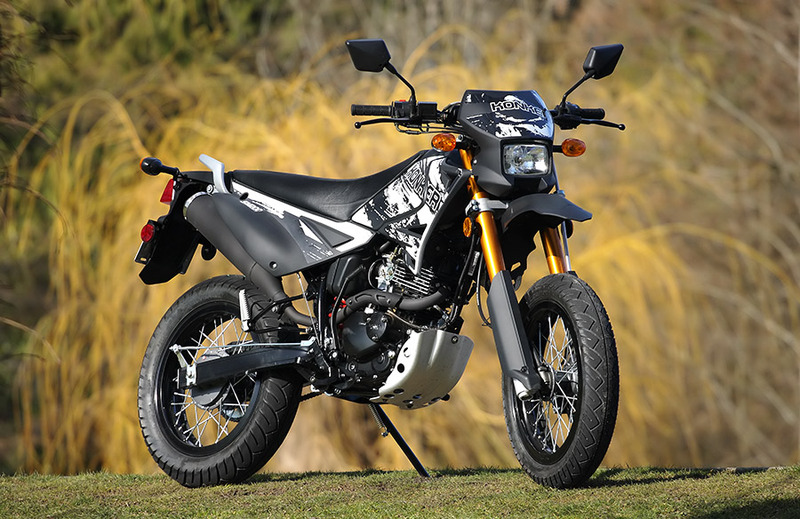 Plus the gauges offer a speedo, tachometer (rare on low-end dualsports) and even a digital gear indicator – though the latter is hard to see in direct sunlight it’s definitely new rider friendly. The welds are tidy, the routing of the plumbing is clean, and there are little touches like a bash-plate and storage canister for tools and papers under the tail on the left-hand side. The mirrors could use longer stocks, but are stylishly shaped and fully adjustable. And the seat is relatively comfortable, a good thing as our test racked up over 800kms of on and off road riding. In total this bike is decidedly refined and pleasant, even before you take into account the price point. And it’s not Dorky looking. If I had a son or daughter at that “I want my bike license age”, the Konker would be top of my list for introductory wonders. Enough power to learn, not enough for serious trouble, and enough visual appeal to keep the kids from being outcasts. Indeed the KSM200, crosses a lot of boundaries. 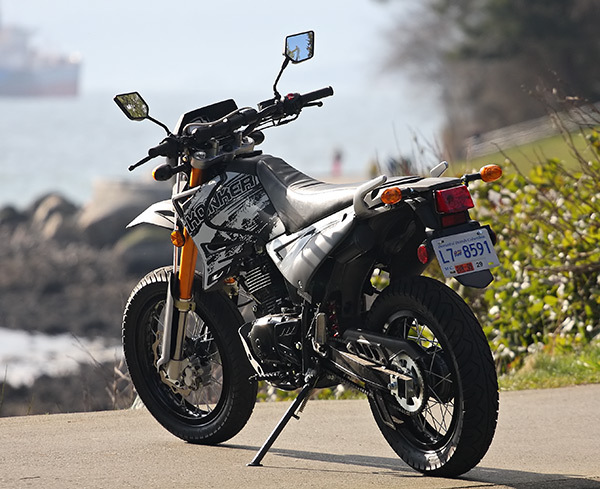 Seeing the bike in action, a downtown Vancouver couple settled on his-and-his Konker KSM200s for urban and rural outings as they reintroduced themselves to riding. By accident or design, the Konker KSM200 finds itself strongly positioned in the new rider’s market. Honda’s sporty CBR125R weighs in at $3,599.00, offers one season enjoyment and is about as useful as laminated herring off the pavement. Whereas even after outgrowing it I’d be tempted to keep the Konker around for trails and city. For an additional $600.00 Konker offers an off-road kit consisting of a bolt on 21″ front and 18″ rear wheel, shod in well proven set of Kenda tires, complete with rotor, sprocket and rear drum brake. 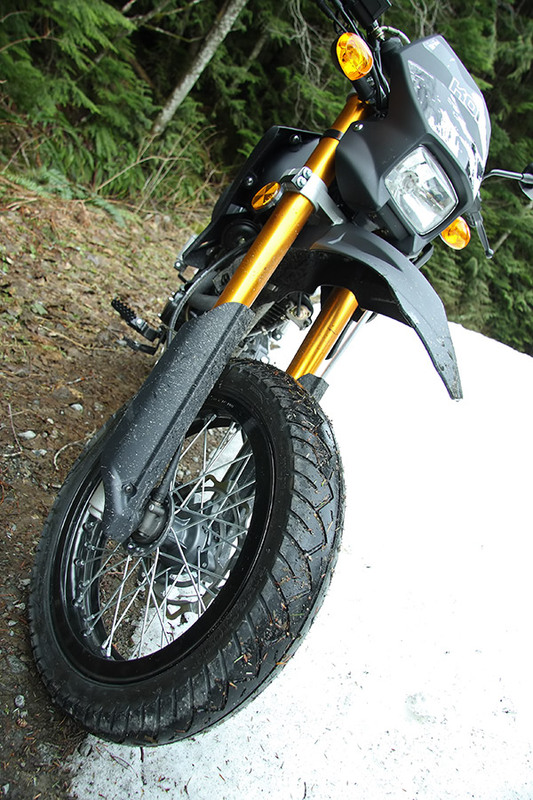 So you’ve got your road and dirt taken care of for $3595.00 leaving $1304.00 for insurance and gas, in comparison to Suzuki’s directly comparable DR200SE which is priced at $4,899. Street shod the Konker KSM200 is picking its way down the steadily narrowing trail, crossing a mud puddle bordering on miniature pond the street tires slip a little, but the Konker holds its line. Rounding the bend, ahead is a steep hill littered with fist size rocks. So far the Konker KSM200 so far has conquered expectations of being a cheap Chinese bike of the “lick it for the GHB in the paint if you want a good high variety”, everything we’ve asked of it the bike has done. I contemplate the hill for a moment, I know the Konker would climb it no problem, but I want the off-road tire kit for the way back down – I like the value proposition of two bikes in one. Thanks to Konker Motors for the use of the KSM200 tester. i think they should come out with a open class bike 500 or 600 or something with some useable power to be able to get on a highway without getting run over. A lot has been written about the disappearance of Konker after the so successfull introduction of the KSM 200. We have taken over the importation of the KSM under our Name for 2012. At present we are going through the motions of having an upgraded KSM brought into Canada. The new Model will have an 250 EFI Motor instead of a carburated 200cc. Any existing Konker KSM 200 Owner looking for parts can contact our Company and we will get you your parts for now directly until our warehouse is setup for the new Line.